You want to take your family on a beach vacation, but still desire that cozy feeling of being at home. The King and Prince Resort has gorgeous two and three bedroom villas that offer the luxury of an ocean front view and the relaxing feel of your own space. Each two bedroom villa offers a master bedroom with a king bed, a second bedroom, and a full bath for each bedroom, while our three bedroom villas offer an additional bedroom and bath. All of The King and Prince Villas provide a living and dining room combo to offer that relaxing space for family entertaining. The villas also offer a fully equipped kitchen so you won’t be without your favorite home cooked meals. 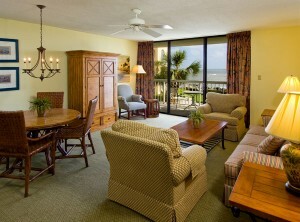 In addition to the resort amenities, each villa includes a washer and dryer as well. The King and Prince would like to show our appreciation for following our blog. Through the months of November and December mention this blog and receive a special rate. Please call 1-877-876-3941 to make your reservation. This entry was posted on Thursday, October 15th, 2009 at 2:35 pm	and is filed under Around the Resort. You can follow any responses to this entry through the RSS 2.0 feed. You can leave a response, or trackback from your own site.